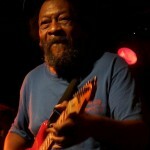 March 18, 1943 Willie King, blues guitarist, composer, and singer, was born in Prairie Point, Mississippi. Prior to recording, he worked at many occupations. King later became active with the Civil Rights Movement which inspired him to write socially conscious blues songs. He described his music as struggling blues because of its focus on the injustices of life in the rural South. In 1983, he founded the Rural Members Association to promote the traditional rural skills he had grown up with. In 1997, the RMA started the annual Freedom Creek Blues Festival which has received international recognition. Albums by King include “Walkin’ the Walk Talkin’ the Talk” (1999), “Living in a New World” (2002), and “One Love” (2006). King was featured in Martin Scorsese’s 2003 documentary “The Blues” and in 2007 a documentary, “Down in the Woods,” was made about King’s life and times. King died March 8, 2009.